Making a follow up to the phenomenal 1996 French film, La Promesse was a daunting task not wished upon even the finest of filmmakers. Leave it to the international cinema machine that is the team of brothers Luc and Jean-Pierre Dardenne to, indeed, not only match the quality of that film, but top it, in the form of 1999�s Rosetta. Powered by an award-winning performance by lead actress �milie Dequenne, Rosetta also earned the Dardennes the Palme d�Or at the 1999 Cannes Film Festival. The Dardennes have continued to make unforgettable films, including The Son, Lorna�s Silence, and their most recent flick, The Kid with a Bike, but there�s just something a little extra special about Rosetta, and, more specifically, Dequenne�s performance. The Criterion Collection finally gives this masterpiece its proper due on Blu-ray, complete with great audio and video, and a few great extras as well. Rosetta (�milie Dequenne) is a teenage girl who wants nothing more than to keep a meaningful job. She�s just lost her job at a local factory and is at a loss as to how she�s going to support her alcoholic mother (Anne Yernaux), who will seemingly do anything for money. When her friend, Riquet (Fabrizio Rongione), a waffle-seller, gets Rosetta a job at a bakery, her happiness is short-lived, as it isn�t long before her boss (Olivier Gourmet) fires her so his son can take over. As her desperation for work mounts, Rosetta turns to betrayal, and potentially even more dangerous methods to finally complete her pursuit of happiness. I�m not sure why it took this long for me to see Rosetta, but it turns out this is the epitome of �better late than never.� I was in love with the film from the first second, as the title character nearly literally bursts onto the screen. The Dardennes waste no time involving us in her plight, as she darts through a door at the factory she�s just been fired from, confronting her boss in a maniacal fashion. 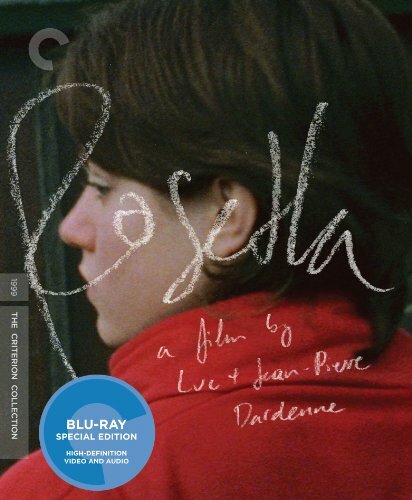 From here until the end credits the audience is on edge, as the Dardennes� as-few-shots-as-possible style utilizes camera techniques that follow each and every one of Rosetta�s moves, often zooming in on her face to enhance the intimacy of the experience. It�s this direct relationship that the Dardennes force between the audience and Rosetta that powers the film, as even when the story slows, we�re compelled by the extremes that Rosetta has gone to previous to a given scene, and the semi- ambiguous ending that hints at what she�s willing to do when all hope in life is apparently gone. If anything, see Rosetta for �milie Dequenne�s performance alone. She won the best actress prize at the 1999 Cannes Film Festival for this work, and there�s no question that she deserved the award, as well as others (*cough* Best Actress Oscar *cough*), that she wasn�t even nominated for. This is as realistic and natural a performance that we�ve seen in the last 20 years, and we might not see anything else like it. Dequenne simply is Rosetta, embodying this character and making us believe she�s actually going through the same emotional strife that is suggested in the screenplay. It�s a surprisingly physically-demanding role as well, requiring Dequenne to lift extremely heavy bags, struggle and drag herself out of muddy water, and do a lot of running. She makes everything look effortless, though, never making it seem as if there�s ever any actual �acting� taking place. Criterion�s Blu-ray disc is another exemplary one, beginning with the 1.66:1 1080p video presentation, which is the result of a restored, high-definition digital transfer that was supervised by director of photography Alain Marcoen. Rosetta has never looked better, thanks to a decent amount of image detail, despite the inherent softness of a film shot in Super 16, and the elimination of virtually all traces of dirt, grain, and other defects. The French DTS-HD Master Audio 2.0 track is also quite good, but the film�s sound design is nothing flashy to begin with, and the mixes crystal clear dialogue is more than enough here. The extras include an interview with filmmakers Jean-Pierre and Luc Dardenne, conducted by film critic Scott Foundas. This 61-minute piece took place in Li�ge, Belgium in 2012, and was filmed for this release. Next, is an 18-minute piece consisting of interviews with Rosetta, herself, �milie Dequenne, and the actor who played her boss, Olivier Gourmet. Given that this was also filmed for this release in 2012, it�s great to see an adult version of Dequenne after becoming so accustomed to watching her stellar, teenage performance in Rosetta. Rounding out the extras collection is the trailer for Rosetta.